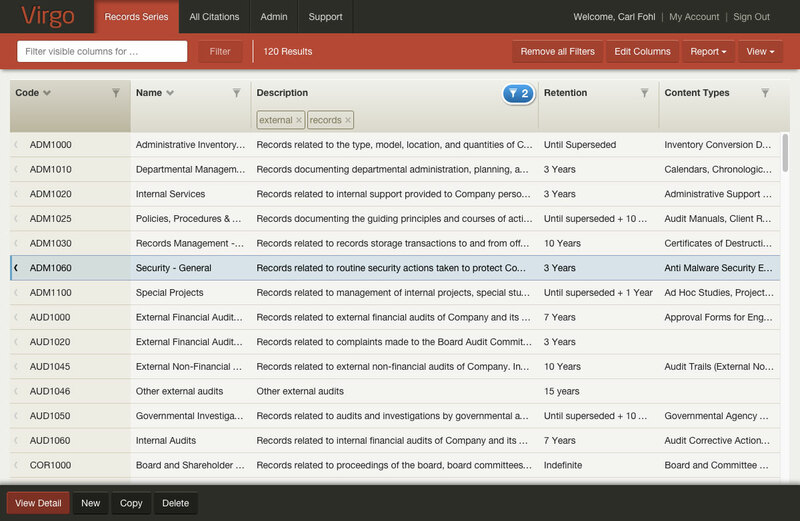 Virgo is a single page app built for Information Governance Solutions. IGS produces solutions for international corporations to aid them in their Records Information Management efforts. Virgo helps the individuals at these corporations understand what documents they are legally required to maintain, and for how long. Virgo is built using AngularJS, Node.js, and Express.js. It is a single page app, meaning it processes all views within the browser, giving it a much faster response, and the feel of a desktop application. The primary view is a tabular grid, somewhat like a spreadsheet. The grid view allows users to edit what columns to show and in what order, and filter and sort the data in a myriad of ways to drill down to the records they are looking for. The datasets the app works with vary from a few hundred rows to tens of thousands. The Virgo project is also the focus of my most recent Case Study. The Record Series table view.